Animals are usually smarter than we give them credit for, but sometimes they need a little help, too. As any pet owner can tell you, the combination of a small opening and a pudgy animal sometimes leads to a sticky situation. 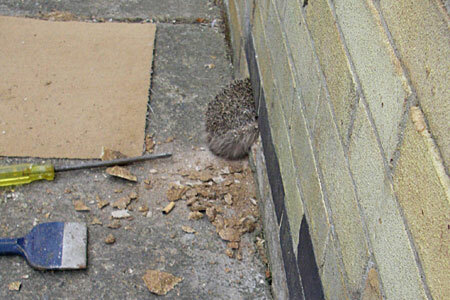 One lucky hedgehog is lucky to have escaped intact after getting stuck in a hole in a wall in Bury St. Edmunds, Suffolk. It took Inspector Jason Finch an hour of chipping away at the wall to free the hedgehog from the wall, but fortunately he’s okay.